Jonah Hendrickson Sculpture Studios has a proven track record in both the greater art world and with the City of San Francisco designing, sculpting, and installing sculptural monuments. Jonah has cooperatively created and installed five major bronze monuments located throughout the United States, in City and State buildings, out door plazas, town squares and major universities. Jonah is currently working on a commission to create a commemorative sculpture honoring the first Jewish Mayor of San Francisco (1894-96), entrepreneur and philanthropist, Aldoph Sutro. Jonah is also the project sponsor of the Harvey Milk Commemorative Sculptures project. The project will be donating 60% of its profits to The Milk Foundation, Lyric, GLBT Historical Society, and the San Francisco Arts Commission. 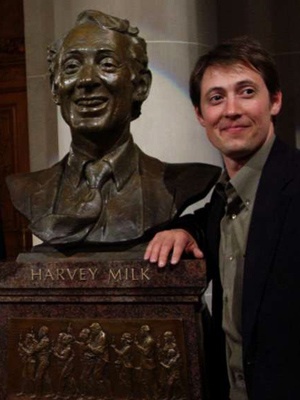 Visit www.harveymilksculpture.com to learn more. Jonah is the founder and director of the Hollis Art Center. The mission of the center is to provide an affordable setting for artist to learn and develop life drawing, life painting, and life sculpting skills. Visit www.hollisartcenter.com to learn more. Jonah lives and works in Oakland, California, where he splits his time between creating commemorative sculptural monuments and his real estate business. He owns a property management company and redesigns industrial warehouse space into small business incubator space, with a focus on community development. Please feel free to contact Jonah for all sculpture/business inquires.